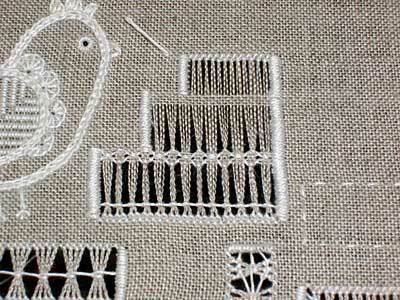 Bunching threads together in different ways and embroidering over the threads using knots and so forth is what makes drawn thread embroidery pretty. It’s the bunching of the threads that gives it a lacy look. One of the most common (and I think most attractive) ways to achieve a nice bunch of threads in drawn thread work is by using the coral knot. So here’s a little photo tutorial to show you how that’s done. The coral knot in drawn thread embroidery is not that different from the coral stitch used in regular surface embroidery. Essentially, the movements of the stitch are the same. 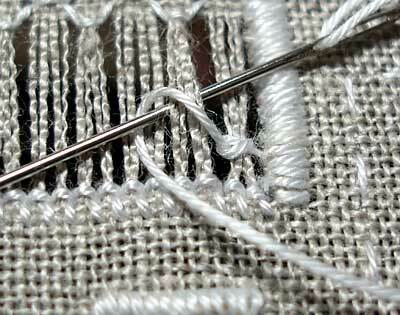 The difference is, of course, that you don’t have a regular ground fabric in drawn thread work, so the line created by your working thread doesn’t come out looking “couched.” Instead, it looks like a thread with knots in it that hold together bunches of vertical fabric threads. To begin, I’ve already finished my edges using satin stitch and withdrawn the vertical threads. I’ve also hemstitched the bottom of the drawn thread area over two threads. 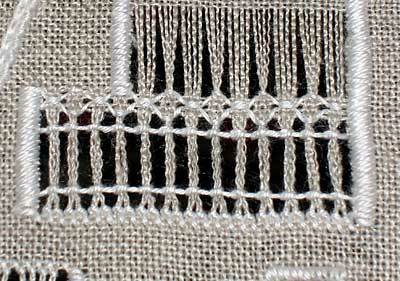 At the top of this piece, I’ve worked Diamond Stitch, grouping together every other four threads. Pull the needle and working thread through the loop, pulling the loop firmly so that the fabric threads bunch together. I find that it helps to pull the working thread forward and upward rather than simply forward on top of your fabric, in order to get the knot to situate itself in the middle of the bunch. Moving on to the next coral knot, take the needle to the back of the next group of four threads and to the front again (in one motion – “sewing” rather than taking your hand to the back of your work!). Come up underneath the working thread again, and inside the loop. 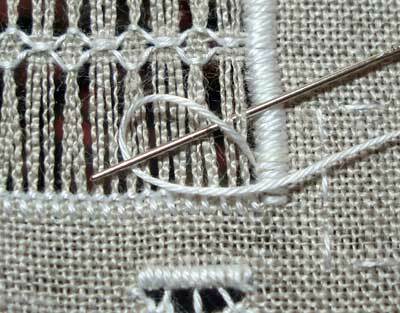 The stitch requires you to come up from the back, then wrap your working thread up over the top of your needle, then down underneath your needle, to form this loop. It’s easier, though, if you simply leave your working thread looped forward on your fabric and you pass underneath the working thread then up into the loop. Again, pull the stitch tight by pulling forward and upwards on your working thread. To keep the line of knots straight, you can use your needle and nudge the knots up or down on the vertical threads, so that you situate them right where you want them. Work all the way across to the other edge of your drawn thread area, then take your thread to the back and anchor it under the satin stitch bars. On this piece, I worked a line of coral knots at the top and bottom of the drawn thread area. As tempting as it would be to slide your working thread up under the satin stitch bars to begin the coral knots going from left to right (on the return journey at the top), don’t. 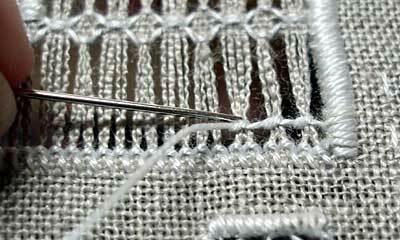 The knots in the lower row are moving in the same direction – if you switch the direction of your stitch (and you’re still working with your right hand), the knots will look different. 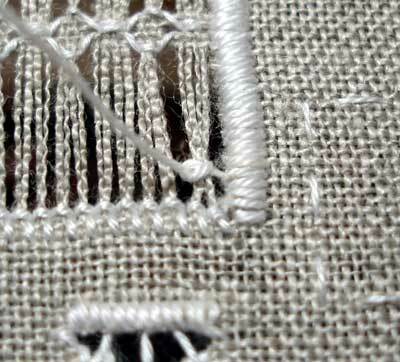 For left-handers, the stitch is worked from left to right, and the looping of the working thread is the same. That’s the coral knot! Have fun with it! Thank you once again for a clear tutorial with very helpful photos. Such neat knots! And the diamond stitch looks good too. I am delighted to have “discovered” your website – a wonderful encouragement! I have two fabulous books from the A-Z series, one is A-Z embroidered flowers, the other A-Z of embroidery stitches. They are both well worn and much loved resources. And it looks like your site will be the same.Thank you so much.